Contemporary western landscape art is not an oxymoron. YOU REMEMBER THAT day when you first saw the Tetons towering over Jackson Hole, the sun pouring through the cracks of the range’s deep canyons like rays from heaven. That was a good day. Unforgettable, both visually and emotionally. That kind of day is why so many people are still in Jackson years after they planned to leave. “It was May 15, 2000, and I was coming up over Togwotee Pass, and I remember slamming on the breaks and asking, ‘What the hell are those?’ ” says Todd Kosharek. “Those” were the Tetons. “I couldn’t believe I was looking at something like that that was sixty to eighty miles away,” says Kosharek, who now lives and paints in Jackson. Kosharek is not the first artist to have an emotional response to the Tetons. 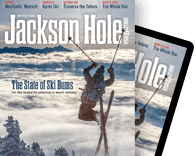 Jackson Hole and its environs have attracted artists seeking to capture the emotion and essence of this place since the 1850s. With paint and brushes, lenses and film, they seek to bring to the masses the feeling found in that first glimpse of the Tetons or a bubbling geyser in Yellowstone or the thunderous Upper Falls of the Yellowstone. While the earliest artists to the valley stuck to strict re-creations of our landscapes—a member of the Hayden Expedition of 1871, Thomas Moran, accurately sketched the wonders of Yellowstone in an effort to convince the U.S. Congress that the area was worthy of protection—landscape artists today have more freedom. Kosharek’s landscape work is heavy with paint, layered and layered again with deep blues and greens as he works multiple seasons—summer and fall and even winter, all at once—into the canvas. To see Kosharek’s point of view requires considering his landscapes from every angle, from a distance, and then from close-up, nose almost pressed to the paint. It’s the same feeling you get when you are outside, taking in the view, seeing the details of sage and the way the sun hits the hills at any given time of day. Inspired by realistic landscape artists including Moran and Iceland’s Johannes Kjarval, Kosharek says he didn’t really paint the mountains for two years after that moment on Togwotee. It took him that long to find his own brushstrokes and his own style. Kosharek needed to break free of what he calls his “juvenile sense of art” and what he thought others wanted to see so that he could paint what he felt and saw, and how he felt it and saw it. 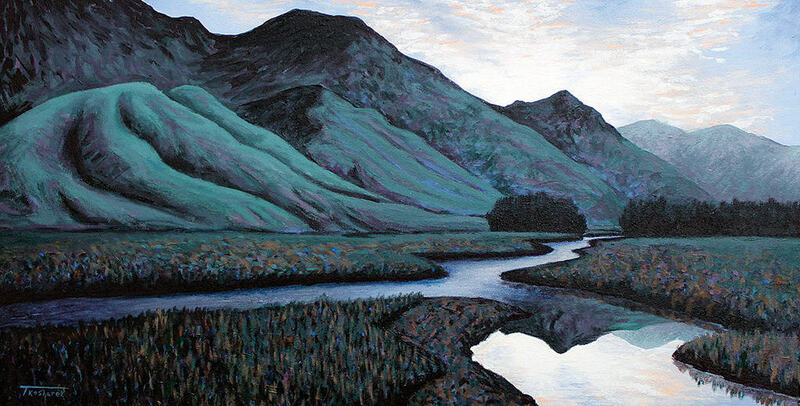 Now Kosharek, who attended the University of Wisconsin, Milwaukee, where he pursued a bachelor of fine arts (BFA) in painting before graduating with a degree in art history, is a father and happily struggles to layer paint upon paint, wanting to show his son what he felt that first day he saw the Tetons. “In art, you are trying to say something new. I want to say something true,” he says. 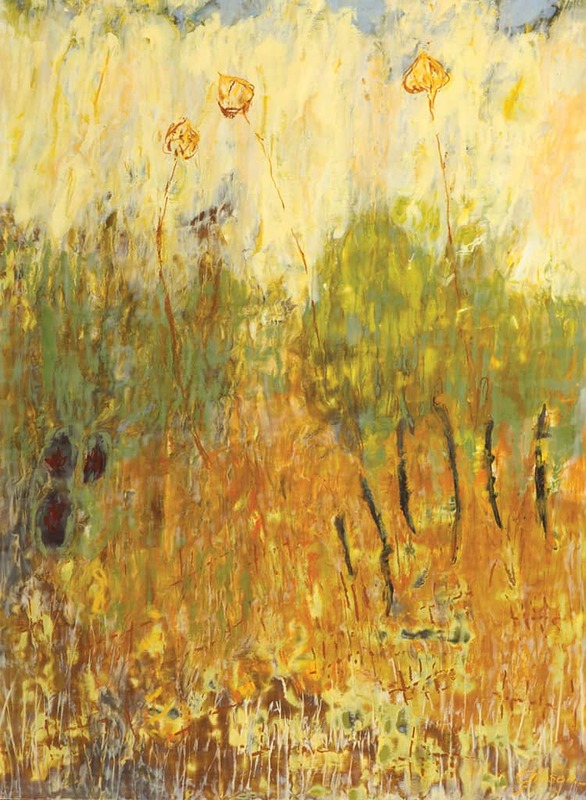 PORTLAND TRANSPLANT PAMELA Gibson always starts a painting by studying a photograph she has taken in the landscape. She then begins sketching. “In the underpainting there is a realistic sketch as I try evoking the feeling I get thinking about the landscape,” she says. Gibson’s finished work is fully abstract; any use of a photo is unrecognizable once a piece is complete. “There is a lot of metaphor in landscape,” she says. “Most of my paintings are unrecognizable. You can’t look at my paintings and define it.” While you wouldn’t know if a painting of Gibson’s was of the view from her front yard or something on the National Elk Refuge, it doesn’t matter. She seeks to extract mood and feeling in viewers and create emotion. She succeeds. While the landscape Gibson is painting is not recognizable, the feeling of the vastness of Wyoming is, as is our delicate, constantly changing light. 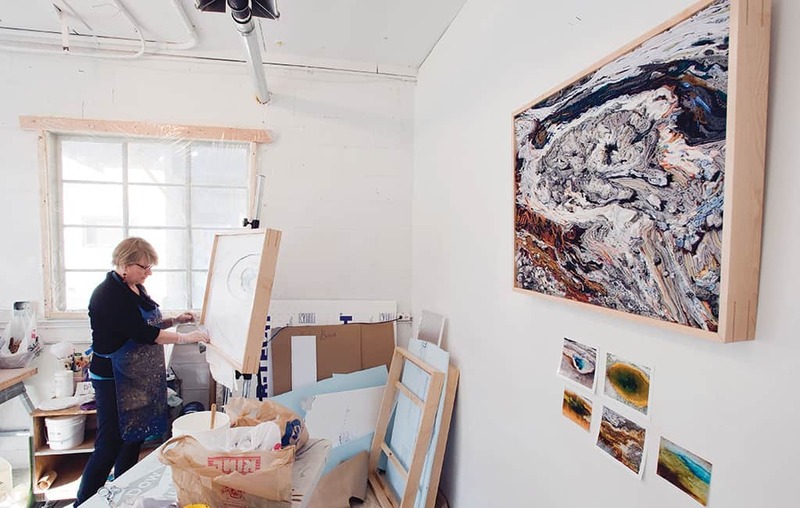 IN A BRIGHTLY lit studio space in downtown Jackson, Teton Artlab provides space: studio space, exhibition space, and performance space for local and visiting artists. Last February, Cheyenne-based artist Georgia Rowswell pieced together—weaving and gluing—thousands of miles of fabric to create Hot Yellowstone #6, one in her series inspired by the colors of the geothermal features in Yellowstone National Park. Not that you would recognize a geothermal feature. Rowswell’s pieces are micro perspectives. “I’m attracted to the close-up,” she says. “The average tourist looks at the big picture; I look at the details, the complicated surfaces.” Thermal features are particularly good subjects for Rowswell because “the colors and patterns are beautiful and dangerous,” she says. Cheyenne artist Georgia Rowswell works in a studio at the Teton Artlab during her residency there last year. Rowswell uses fabric to capture micro vistas of Yellowstone’s thermal features. And that is Walker’s work. His landscapes are familiar scenes—the demolition derby, the base of Snow King, the Town Square, or a downtown trailer park—rendered in a way that encourages us to take a pause, then a deep breath. He breaks down scenes, leaving viewers with a simplified version of reality where light and lines create a new perspective of an old, or ordinary, landscape. 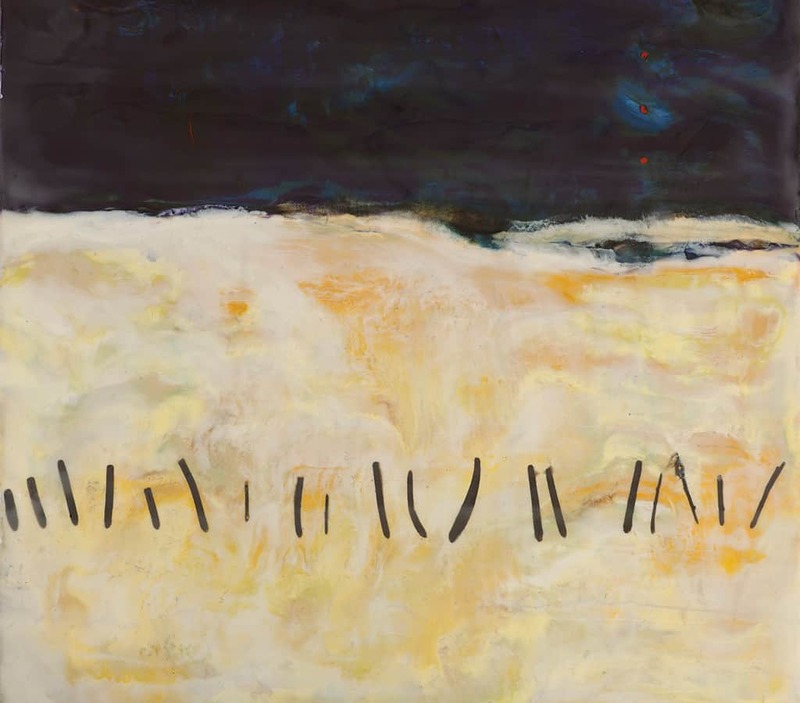 Walker reminds viewers of that first time they saw the light hit the Tetons at dusk or how the hay bale interrupted the endless lines made by a tractor across a rancher’s field. MEG DALY WORKS to publicize art by local contemporary artists through Daly Projects, her gallery founded in February 2015 that recently relocated inside Teton Artlab. “Because [the art] is so abstract, there is this emotion that comes through and mood,” says Daly of the work she sells. “It’s time passing that can inform the mood, but it seems to represent our lives in Wyoming. As westerners, we’re really aware of the light and the landscape and the time of day. One of the things I love about [Pamela] Gibson’s work is that it captures the moods of the landscape.” In addition to Gibson, Daly Projects also represents Scotty Craighead, Camille Davis, Katy Ann Fox, Mark Morgan Dunstan, and Ed Lavino, who are all locals. “The gallery has been a work in progress,” Daly says. “That was the plan from the get-go and now it has evolved.” Sounds just like the state of western art today.